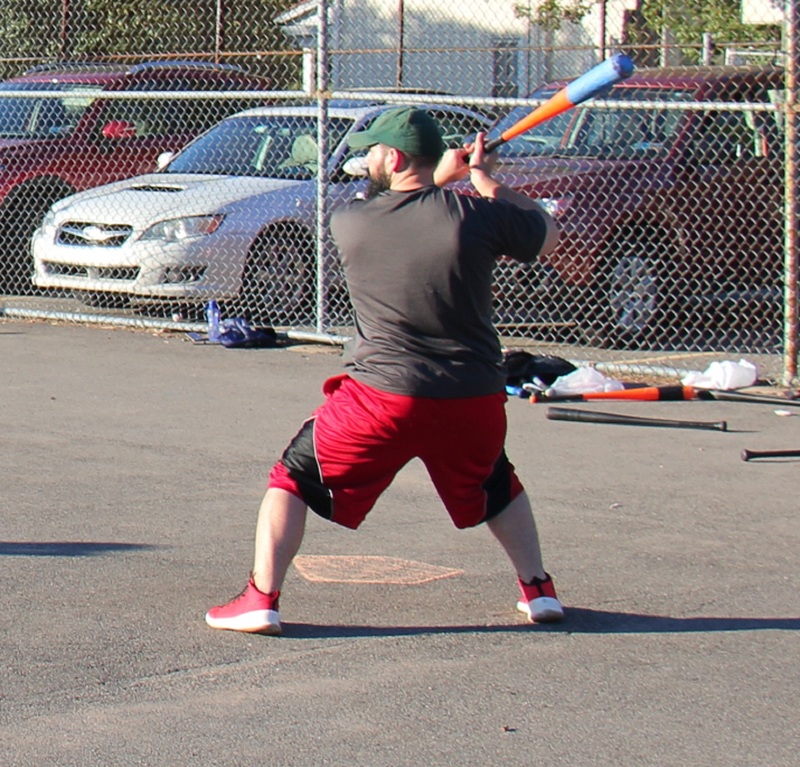 Cookies & Cream took an early lead behind homers from Guthrie and Blose, and Joey avoided allowing big innings to the Questionable Outfit offense, as Cookies won 7-4 and moved closer to Questionable in the standings. Bob led off the top of the first with a single, and he moved to second on a Tom single. With no outs and two runners on, Joey looked to be in trouble, but he escaped the jam, retiring Mike and Nate to strand both runners and end the inning. Questionable sent Bob to the mound in what was only his second start of the season. He retired Guthrie to start the inning, but Blose followed with a deep solo homer to center field, and Cookies led 1-0. Joey followed with a double, but Bob avoided further damage, retiring Jordan to strand the runner and end the inning. Bob provided his own run support in the top of the second, tying the game at 1-1 when he led off with a solo homer to right-center. Tom followed with a double, but Joey stranded him, retiring Mike and Nate to end the inning. Cookies had a big inning in the bottom of the second. Guthrie led off with a solo homer to make the score 2-1, and Blose followed with his second homer in as many at-bats. The back-to-back homers put Cookies ahead 3-1. Joey then tripled, and he scored when Jordan followed with an RBI double. Cookies led 4-1, and Bob was removed from the game. Questionable turned to Tom, who retired the first batter he faced, Guthrie. With one out, Blose doubled, scoring Jordan and putting Cookies ahead 5-1. Tom then retired Joey to end the inning, and Cookies had pulled ahead by four runs. For the second consecutive inning, Bob led off the top of the third with a solo homer, and the blast cut the Cookies lead to 5-2. Joey then retired Tom and Mike to end the inning and maintain a three-run lead. Jordan started the bottom of the third with a double, and Guthrie followed with a two-run shot, his second homer of the game. 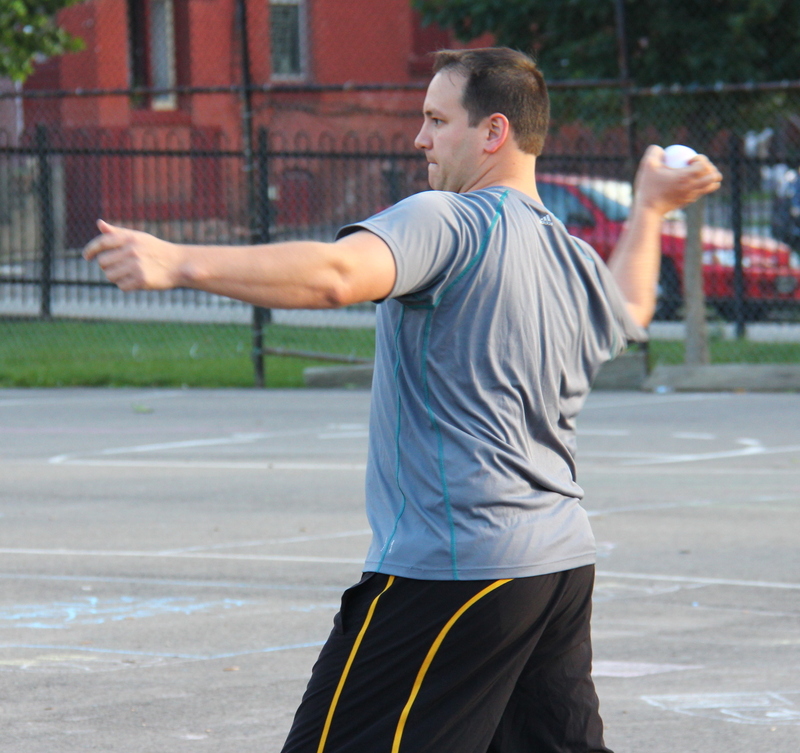 Tom retired Blose and Joey to end the inning, but Cookies had extended their lead to 7-2. Joey retired the side in order in the top of the fourth, and the score remained 7-2. Jordan led off the bottom of the fourth with a single, but he was caught out trying to extend the hit into a double. Tom then retired Guthrie to end the inning. Down five, Tom led off the top of the fifth with a solo homer, and the score was cut to 7-3. Two batters later, Nate hit a solo shot to left, and Questionable trailed 7-4. Bob followed with a single, but Joey limited the damage to two runs, retiring Tom to end the inning. Tom retired the side in order in the bottom of the fifth, and Questionable trailed by three runs heading into the sixth. Cookies & Cream turned to the bullpen, bringing Blose in for the save in his first pitching appearance of the 2016 season. He retired Mike and Nate in order, earning the save and ending the game, giving Cookies & Cream a 7-4 win. – Joey earned the win for Cookies & Cream, allowing 4 runs on 8 hits in 5 innings pitched. – Blose pitched one inning of perfect relief, and he earned the first save for any pitcher in 2016. – Bob took the loss for Questionable Outfit, giving up 5 runs on 6 hits in a single inning pitched. – Tom pitched 4 innings of relief, allowing 2 runs on 4 hits. – Blose led Cookies & Cream on offense, going 3-for-5 with a double, 2 homers, 2 runs scored, and 3 RBI. – Guthrie also homered twice for Cookies, going 2-for-5 with 2 runs scored and 3 RBI. – Bob led Questionable Outfit at the plate, going 4-for-5 with 2 singles, 2 homers, 2 runs scored, and 2 RBI. Blose homered twice, and he and Guthrie each homered in the bottom of the fourth inning to help propel Cookies & Cream to a 5-3 come from behind win over Eastbound & Dahn. Guthrie took the mound for Cookies & Cream, and he avoided trouble in the top of the first. Nate led off the game with a double, but Guthrie stranded him, retiring Dustin and Tom Shark, who was filling in for a depleted Eastbound roster. Christian got the start for Eastbound, and he cruised through the bottom of the first, retiring Guthrie and Blose in order. Eastbound would jump out to an early lead in the top of the second. Nate doubled with one out, and Dustin drove him in with an RBI double that made the score 1-0. Shark then singled, scoring Dustin from second to put Eastbound ahead 2-0. Christian followed with a double to put runners on second and third, but Guthrie avoided further damage, retiring Nate to strand both runners. Christian allowed a leadoff double to Joey to start the bottom of the second, but he maintained the Eastbound lead, retiring Jordan and Guthrie to strand the runner at second. Eastbound added to their lead in the top of the third. Shark tripled with one out, and Christian drove him in with an RBI single. Guthrie retired Nate to end the inning, and Eastbound led 3-0. Cookies & Cream got on the board in the bottom of the third and reduced the deficit. Blose led off the inning with a solo shot, making the score 3-1. Joey singled, and two batters later, Guthrie singled, scoring Joey from first to cut the score to 3-2. Christian then retired Blose, maintaining a one run lead. Dustin led off the top of the fourth with a single, but Eastbound couldn’t add to their lead, as Guthrie retired the next two batters to end the inning. Cookies would pull ahead in the bottom of the fourth with big hits from Guthrie and Blose. Joey led off the inning with a double, and two batters later, Guthrie launched a two-run blast to left-center, and Cookies led 4-3. Blose followed with his second solo homer of the game, and the back-to-back jacks put Cookies ahead 5-3. Christian then got Joey to fly out to end the inning, but Eastbound now trailed by two runs. Dustin doubled with one out in the top of the fifth, but Eastbound couldn’t rally, as Guthrie retired Shark to end the inning and strand the runner. Christian retired the side in order in the bottom of the fifth, and Eastbound would head into their final at-bat down two. Guthrie remained in the game to close things out, and he was efficient in doing so. He retired Christian and Nate consecutively, and after allowing three runs early, pitched three scoreless innings to end the game and give Cookies & Cream the 5-3 win. 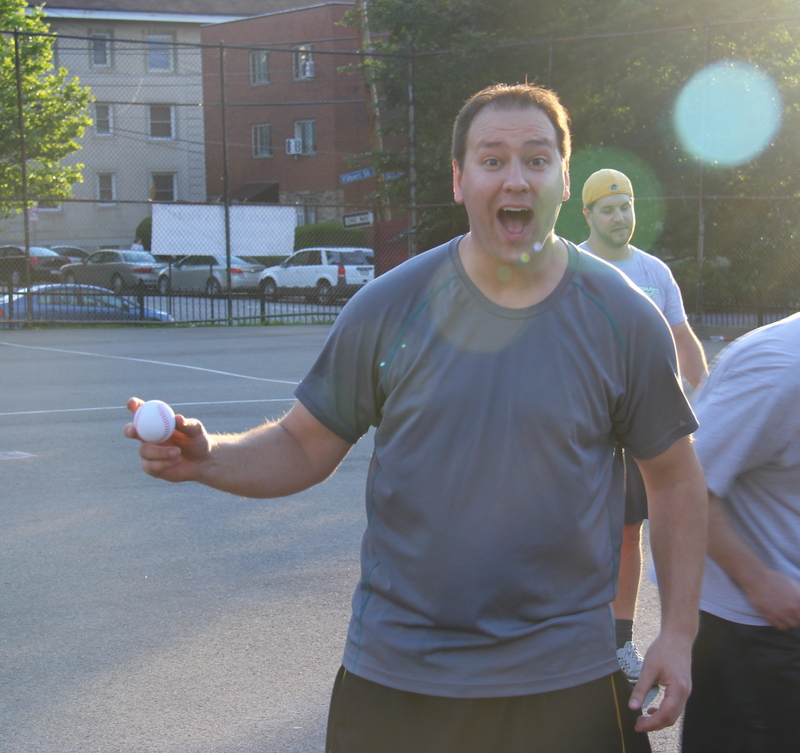 The victory moved Cookies & Cream to 8-5 on the season, and the loss dropped Eastbound & Dahn to 1-12. – Guthrie pitched the complete game win for Cookies & Cream, allowing 3 runs on 9 hits in 6 innings. – Christian took the loss for Eastbound, giving up 5 runs on 7 hits in 5 innings pitched. – Blose led Cookies & Cream at the plate, going 2-for-4 with 2 homers, 2 runs scored, and 2 RBI. 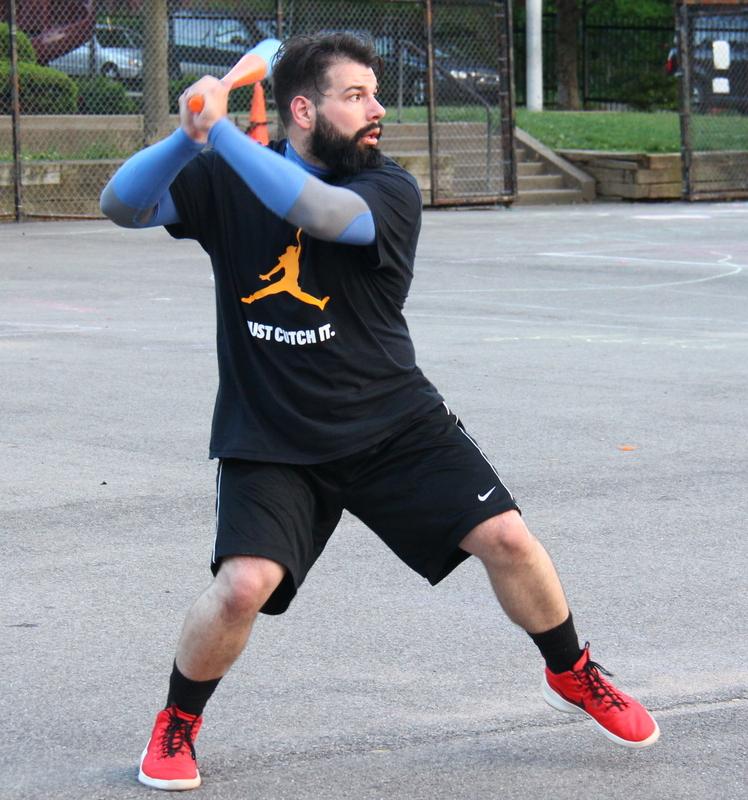 – Joey also went 3-for-4 for Cookies & Cream with a single, 2 doubles, and 2 runs scored. – Dustin led Eastbound & Dahn on offense, going 3-for-5 with a single, 2 doubles, a run scored, and an RBI. 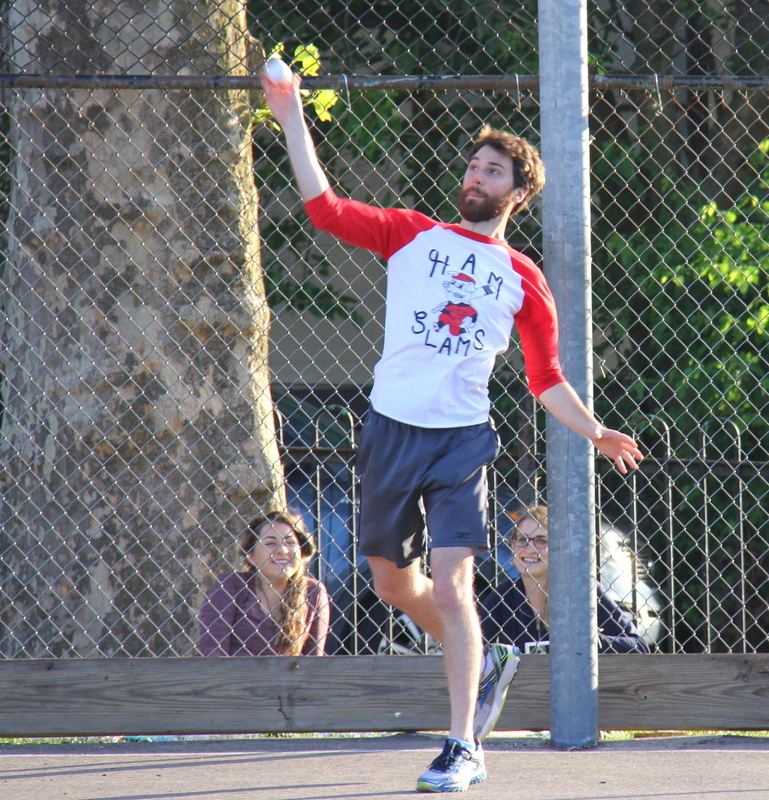 The Ham Slams brought their bats against Questionable Outfit, and they led early before Bob and the Questionable Outfit stormed back to steal an 8-7 win. Bob’s three-run homer in the bottom of the fourth put Questionable ahead for good, as Nate closed out the win for Questionable in relief. Questionable Outfit sent Mike to the mound as their starting pitcher, and he avoided trouble early. Tim hit a one-out triple, and it looked as if the Ham Slams would jump ahead, but Mike retired Dan to strand the runner and end the inning. 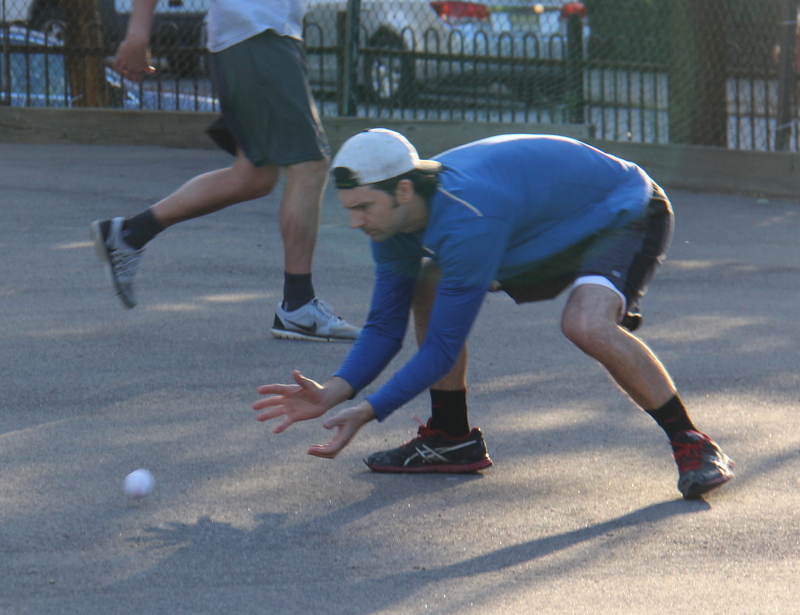 In the bottom of the first, Questionable got to the Ham Slams starter, Tim, to take an early lead. Bob singled and moved from first to third on a Tom double. With two runners in scoring position, Mike grounded out, scoring Bob to put Questionable ahead 1-0. Nate then hit an RBI single to score Tom, and Questionable led 2-0. Tim avoided further damage, retiring Bob to end the inning, and the Slams trailed by two runs. The Ham Slams bounced back in the top of the second to tie the game. Kessler singled, and he scored on an RBI triple by Josh that made the score 2-1. Tim then grounded out to right, but Josh scored on the play, and the game was tied at 2-2. Mike then retired Dan to end the inning with the game tied. Questionable, as usual, came storming back in the bottom of the second. Tom led off the inning with a solo homer to left-center, making the score 3-2. Mike followed with a solo shot, and the back-to-back jacks gave Questionable Outfit a 4-2 lead. Two batters later, Bob hit a one-out double, and Tom drove him in with an RBI single that extended the Questionable lead to 5-2. Tim retired Mike for the second out of the inning, and Questionable had taken a three run lead. Showing resiliency, the Slams punched right back in the top of the third. They started a one-out rally when Josh hit a double, and he scored when Tim followed with an RBI triple that made the score 5-3. Dan then tripled, scoring Tim, to cut the score to 5-4. Kessler stepped to the plate and launched a deep two-run homer to left, and in four swings the Ham Slams had reclaimed the lead at 6-5. Josh followed with a double, and just when it looked like the Slams would extend their lead, Mike retired Tim for the second out, ending the inning. 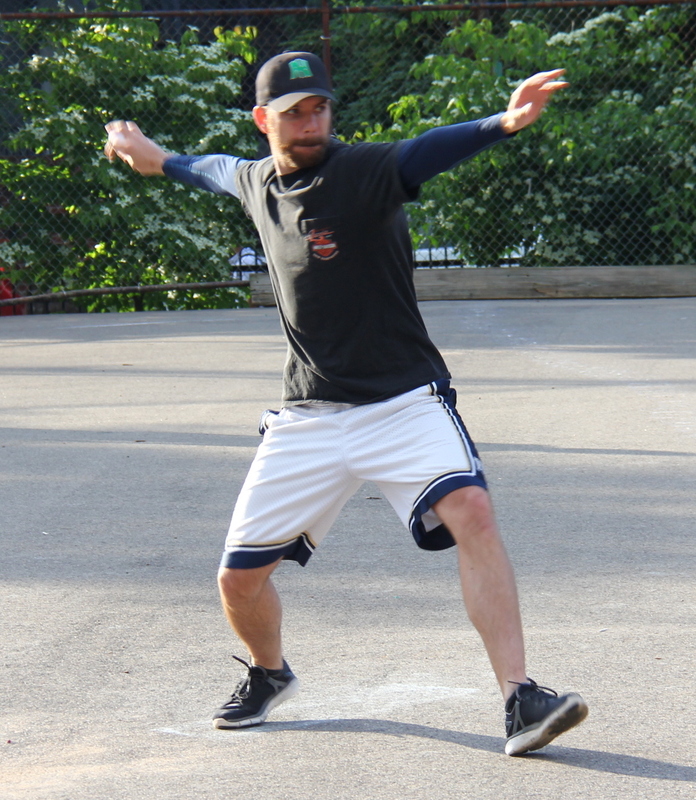 Tim cruised through the bottom of the third, retiring Nate and Bob in order, maintaining the one-run lead. Questionable removed Mike from the mound and turned to their staff ace, Nate, for relief. He retired Dan, the first batter he faced, the but the next batter, Kessler, launched a solo shot, his second homer in as many at-bats. Josh followed with a triple, and the Slams looked to extend their lead, but Nate retired Tim to end the inning, and the Slams led 7-5. Tim retired Tom to start the bottom of the fourth, and then Questionable Outfit began their rally. Mike singled, and Nate followed with a single to put runners on first and second with one out. Bob came up to bat and crushed a three-run bomb to right field, putting Questionable ahead 8-7. Tom followed with a line drive off the fence. A series of fielding errors led him to attempt an inside-the-park homer, but he was caught in between third and home for the second out of the inning. Questionable had pulled back in front 8-7, and the Slams couldn’t rally in the top of the fifth. Nate retired Dan, and then fanned the red hot Kessler to end the inning. Tim sent Mike and Nate down consecutively in the bottom of the fifth, and the Slams would come to the plate in the top of the sixth trailing by only a run. Nate remained in the game, and he struck out the first batter he faced, Josh. Down to their last out, the Slams couldn’t rally, as Nate retired Tim to end the inning and the game, giving Questionable Outfit the 8-7 win. 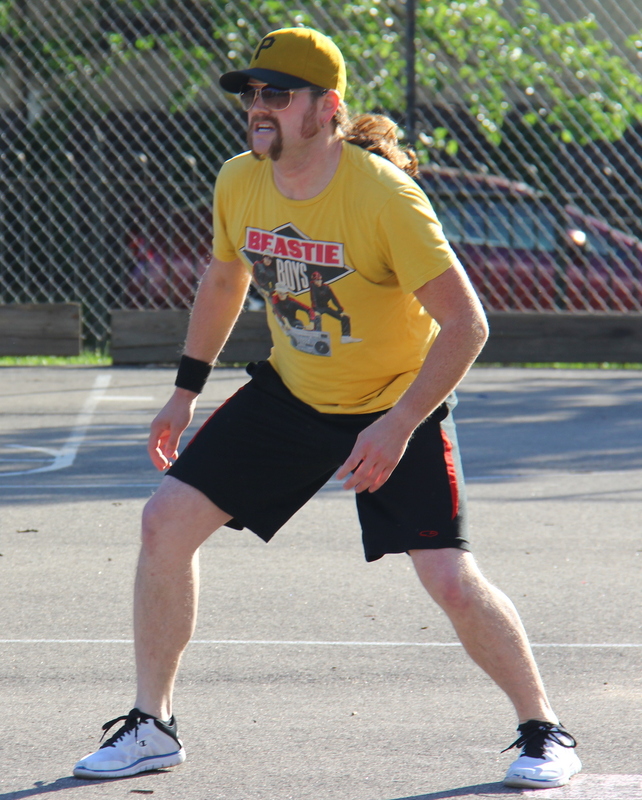 The win moved Questionable Outfit to 11-2 on the season, and the Ham Slams dropped to 6-7. – Nate earned the win for Questionable Outfit, allowing 2 hits and one run in 3 innings of relief, striking out two. – Tom started the game for Questionable and got the no decision, allowing 6 runs on 8 hits in 3 innings. 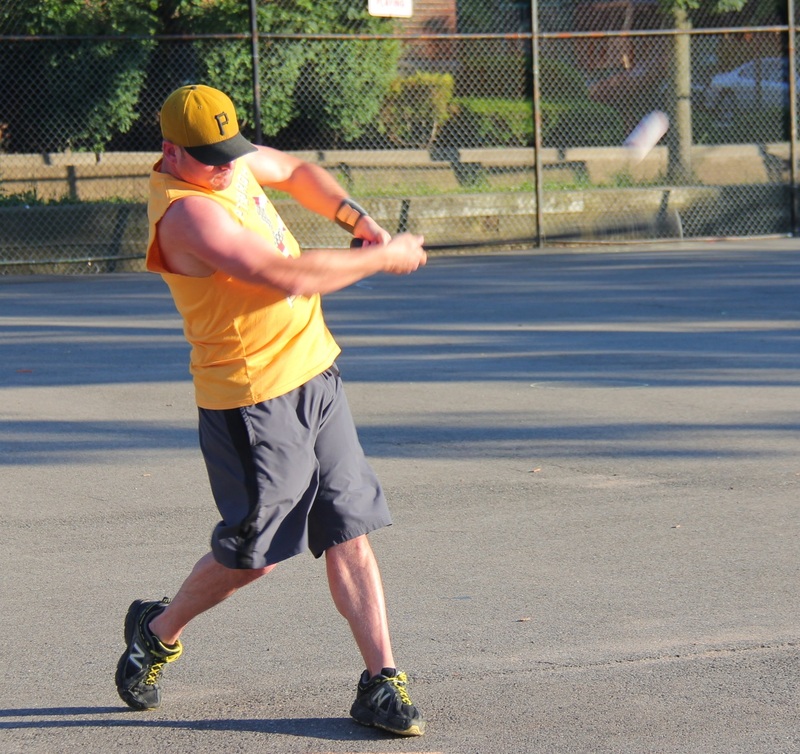 – Tim took the loss for the Ham Slams, giving up 8 runs on 11 hits in 5 innings. – Tom led Questionable Outfit on offense, hitting for the cycle and going 4-for-5 with a single, a double, a triple, a homer, 2 runs scored, and 2 RBI. 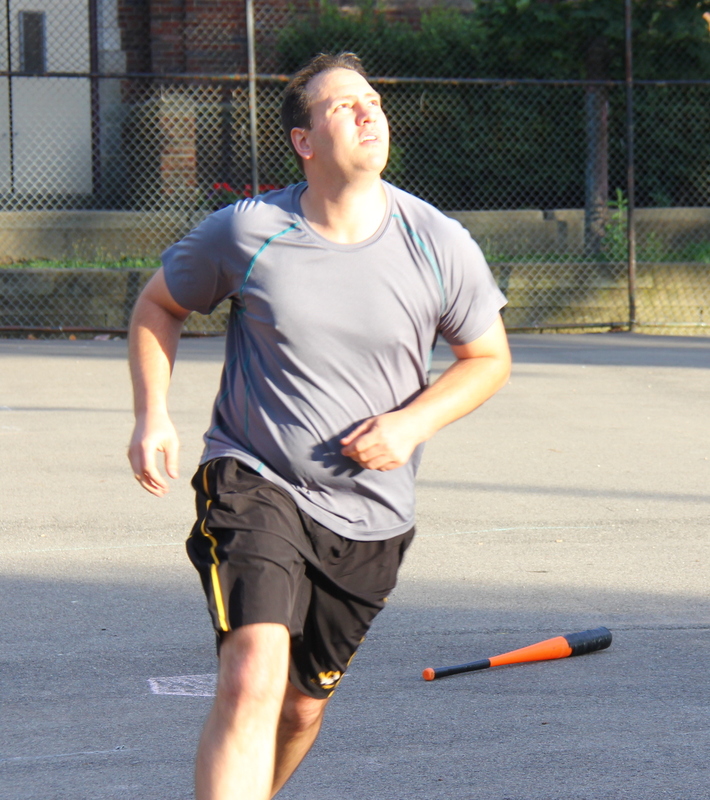 – Bob also went 3-for-6 for Questionable, with a single, a double, a homer, 3 runs scored, and 3 RBI. – Josh led the Ham Slams on offense, going 4-for-6 with 2 doubles, 2 triples, 2 runs scored, and an RBI. 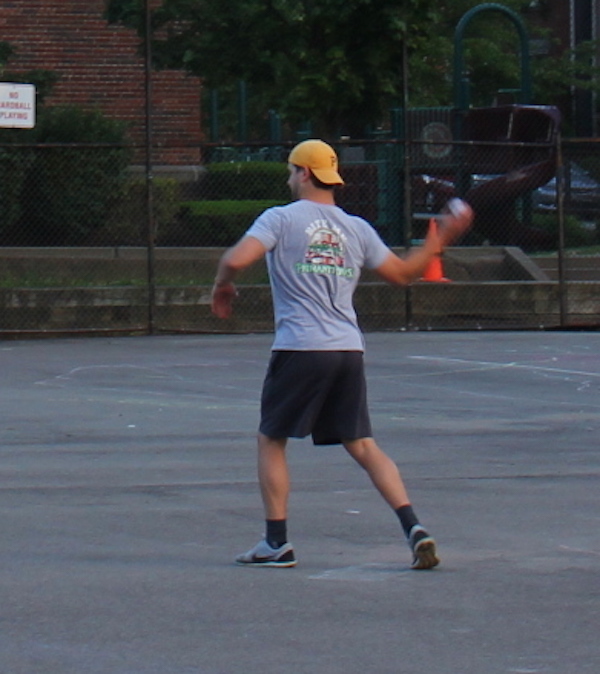 Tom pitched the complete game win for Questionable Outfit, allowing only a single run, a solo homer by Blose in the first inning. 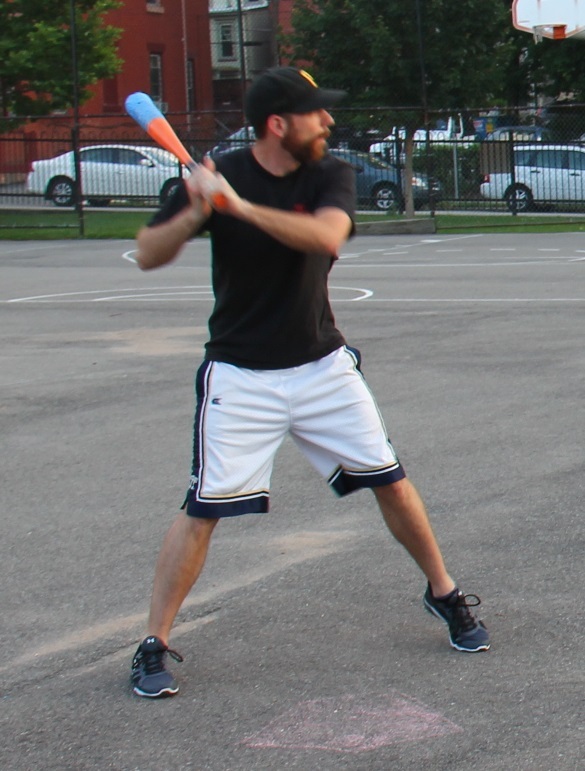 Tom scattered four hits and only a single run in a complete game win for Questionable Outfit, and Bob added three hits, including a two-run homer, as Questionable beat Cookies & Cream 5-1 to remain atop the EWL standings after six weeks of play. Dinger took the mound for Cookies & Cream, and he escaped the first inning without damage. He gave up a one-out double to Tom, but he stranded the runner, retiring Mike to end the inning. Cookies would jump ahead early in the bottom of the first, when Blose hit a one-out solo shot off Tom, putting Cookies ahead 1-0. Tom then retired Joey to end the inning. Questionable Outfit bounced right back in the top of the second. Nate doubled to start the inning, and Bob followed with a two-run blast to right-center, giving Questionable a 2-1 lead. Dinger retired the next two Questionable batters, and Cookies trailed by a run. Tom helped to provide his own run support, going 3-for-6 with a single and 2 doubles. Dinger led off the bottom of the second with a single, but Cookies couldn’t drive him in, as Tom retired Jordan and Guthrie to end the inning, stranding the runner. Questionable would add more run support in the top of the third. Nate led off with a triple, and he scored on a Bob RBI double which made the score 3-1. Tom then singled to put runners on first and third, and Bob scored when Mike grounded out for the first out of the inning. Dinger then retired Nate to end the inning, and Questionable led 4-1. Tom continued to cruise in the bottom of the third, sending Blose and Joey down in order. Dinger matched him in the top of the fourth, retiring the side without allowing a run. Tom retired his fifth and sixth consecutive batters in the bottom of the fourth, sending Dinger and Jordan down consecutively. Mike started the top of the fifth with a single, and two batters later he moved from first to third on a one-out single by Bob. Tom then doubled, scoring Mike to make the score 5-1. Questionable had runners on second and third, but Dinger avoided a big inning, retiring Mike and Nate to end the inning. Guthrie led off the bottom of the fifth with a double, but the next batter, Blose, flew out to the mound, and Guthrie was doubled up on the play to end the inning. Nate watches the ball soar as he connects on a double off the fence. He went 2-for-5 in the game with a double, a triple, and two runs scored. Dinger retired the side in order in the top of the sixth, and Cookies came to the plate trailing by four runs in the bottom of the sixth. Dinger hit a one-out single, but Cookies couldn’t rally, as Tom retired Jordan to end the inning, giving Questionable Outfit the 5-1 win. The win moved Questionable to 10-2 on the season, while Cookies dropped to 7-5, three games behind Questionable in the standings. – Tom pitched the complete game win for Questionable Outfit, scattering 4 hits and one earned run in 6 innings pitched. – Dinger took the loss for Cookies & Cream, allowing 5 runs on 9 hits in 6 innings. 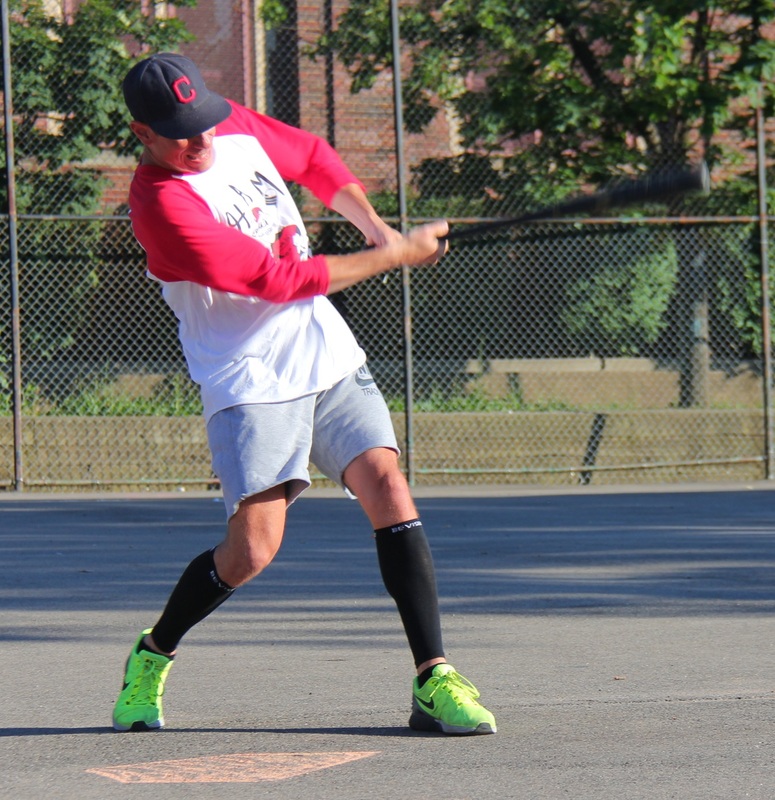 – Bob led Questionable Outfit on offense, going 3-for-6 with a single, a double, a homer, 2 runs scored, and 3 RBI. – Blose’s solo homer in the bottom of the first provided Cookies & Cream only scoring. He was 1-for-3. Nate retired all 12 batters he faced against the Ham Slams, completing the first regular season no hitter/perfect game in EWL history. Nate of Questionable Outfit made history against the Ham Slams, retiring all twelve batters that he faced, becoming the first pitcher in EWL regular season history to throw a perfect game. Nate joins Guthrie and Bob as the only two pitchers to throw no-hitters. The previous two no-nos were throws in the playoffs, and after 222 regular season games over 6 years, Nate became the first to achieve perfection. Nate had three factors working in his favor for his historic start; the Ham Slams were playing with two players making their debut, Dave and Dan, they were playing without two of their best hitters, Dan and Kessler, and the wind was blowing hard. Nonetheless, Nate took full advantage, and he retired the side in order in the top of the first. Questionable would provide all the run support that he would need in the bottom of the first. Bob led off the inning with a single and moved from first to third on a Tom double. Mike cleared the bases with an RBI single, and Questionable led 2-0. Nate then singled to put runners on first and third, and Mike scored when Bob grounded out for the first out of the inning, making the score 3-0. Tom followed with a two-run blast, and Questionable was ahead 5-0. Tim, the Ham Slams starter, finally retired Mike to end the inning, and the Slams trailed by five through an inning. Nate rolled through the top of the second, sending Dan and Tim down consecutively. Josh and the Ham Slams defense were chasing balls all night. Here he launches one into the pitcher with a few Ham Slams fans behind him looking on. Nate started the bottom of the second with a single and moved to third on a Bob single. Tom emptied the bases with an RBI double, and Questionable led 7-0. Mike then doubled to score Tom, pushing the Questionable Outfit lead to 8-0. Tim buckled down, retiring Nate and Bob to end the inning, and the Slams were down by eight runs. Dave and Josh were retired in order in the top of the third, and Nate was perfect through three innings. Tom doubled to lead off the bottom of the third, and he advanced to third on a Mike sacrifice fly, but Tim was able to escape the inning without allowing a run by retiring Nate for the second out. Dan and Tim went down in the top of the fourth, and Nate had retired the first eight batters that he had faced. Bob and the Questionable Outfit defense were tight behind Nate. Bob collected 9 putouts, including the final 7 of the game. Bob started the bottom of the fourth with a triple, and he scored on a Tom RBI single that made the score 9-0. Mike singled to put runners on first and second, and Nate pushed the runners to second and third with a single, but was caught out rounding first. Bob cleared the bases with an RBI triple, putting Questionable Outfit ahead 11-0. Tom then tripled, scoring Bob to make the score 12-0. Tim ended the inning by getting Mike to fly out to the mound, and the Ham Slams were down by a dozen. The fifth inning came and went quickly as Nate retired Dave and Josh, and he was an inning away from history. Questionable would add a few more insurance runs in the bottom of the fifth, adding insult to injury. Nate singled, and he scored from first on a Bob RBI double that made the score 13-0. Tom then doubled, scoring Bob, and the score was 14-0. 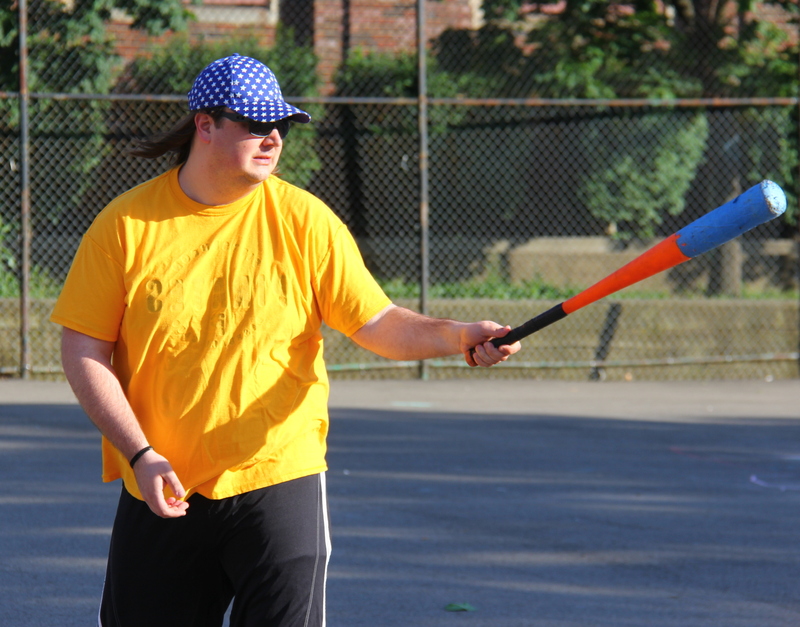 Mike followed with an RBI single, scoring Tom, and Questionable Outfit pulled ahead 15-0. Nate then singled to put runners on first and second, but Tim avoided a colossal collapse, retiring Bob and Tom to end the inning. Down fifteen runs and two outs away from history, the Ham Slams were unable to respond. Nate got Dan and Tim to each groundout to Bob in right field, and Questionable Outfit had made history. Nate retired all twelve batters that he faced without allowing a hit, and he had completed the first regular season perfect game the EWL had ever seen. The win moved Questionable Outfit to 9-2 on the year, and the loss dropped the Ham Slams to .500 at 6-6. – Nate completed the perfect game by getting 11 of the 12 hitters to groundout, and one batter flew out on a towering fly ball to right, which Bob secured. – Tim took the loss for the Slams, allowing 15 runs on 20 hits in 6 innings. – Tom led Questionable Outfit on offense, hitting for the cycle and going 7-for-8 with a single, 3 doubles, a triple, and a homer. He scored 5 runs and had 7 RBI. Guthrie allowed only one hit, a solo homer, and faced only one more than the minimum number of batters, as Cookies & Cream edged Eastbound & Dahn 3-1 in a pitcher’s duel. After picking up their first win of 2016, Eastbound looked to start a winning streak in their second matchup of week 6. The momentum didn’t carry over directly, as Guthrie retired Ivan and Nate in order in the top of the first. Christian took the mound for Eastbound, and he got into trouble early. Blose singled with one out, and Joey drove him in with an RBI double, putting Cookies ahead 1-0. Dinger then singled, scoring Joey from second, and the score was 2-0. Jordan followed with a single, and Guthrie came to the plate with runners on first and third. Christian buckled down, however, and retired Guthrie, stranding both runners and ending the inning. Guthrie cruised through the top of the second, retiring the side in order. Christian got into a groove in the bottom of the second, retiring Blose and Joey in order, and the score remained 2-0. Eastbound continued to struggle in the top of the third, as Ivan and Nate were sent down consecutively. Christian allowed a one-out single to Jordan in the bottom of the third, but he stranded the runner, ending the inning. Guthrie retired Christian and BK in the top of the fourth, and he was perfect through four innings, having retired the first eight batters than he had faced. Cookies added an insurance run in the bottom of the fourth. Blose led off with a double, and he scored when Joey grounded out to deep left, making the score 3-0. Christian then retired Dinger to end the inning, and Eastbound trailed by three runs. The perfect game bid ended in the top of the fifth, when Ivan led off the inning with a deep solo homer to right field. Guthrie would retire Nate and Christian to avoid further damage, and Eastbound had cut the deficit to 3-1. Christian send the side down in order in the bottom of the fifth, and Eastbound would head into their final at-bat trailing by two runs. Guthrie fanned BK for the first out in the top of the sixth, and he got Ivan to ground out to right for the second out, completing the one-hitter and giving Cookies & Cream the 3-1 win. 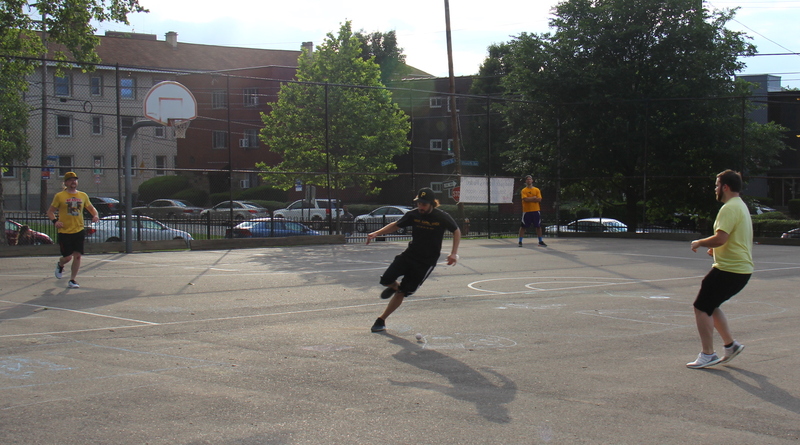 The win moved Cookies & Cream to to 7-4 on the season, and Eastbound & Dahn dropped to 1-11. – Guthrie pitched the complete game for Cookies & Cream, allowing on a single hit and one earned run while striking out one. – Christian took the loss for Eastbound & Dahn, giving up 3 runs on 6 hits in 5 innings pitched. – Blose led Cookies & Cream at the plate, going 2-for-3 with a double, a triple, and 2 runs scored. – Ivan had the only hit for Eastbound & Dahn. He went 1-for-4 with a solo homer. 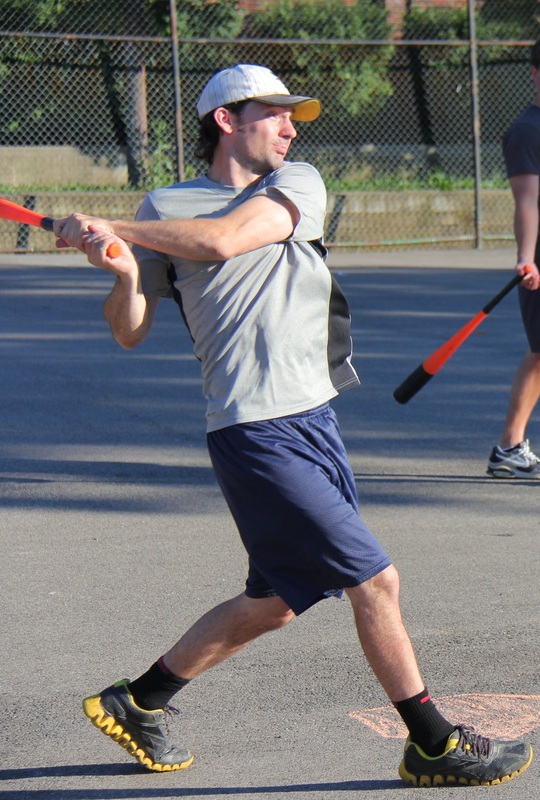 After completing the worst first half of an EWL season in league history, Eastbound & Dahn picked up their first win of 2016 as their former star Ivan made a guest appearance on the wiffle diamond. He went 4-for-5 and scored three runs, as Eastbound topped the Ham Slams 7-3 and finally earned a tally in the win column. BK started on the mound for Eastbound & Dahn, and the Ham Slams would get on the board in the top of the first. 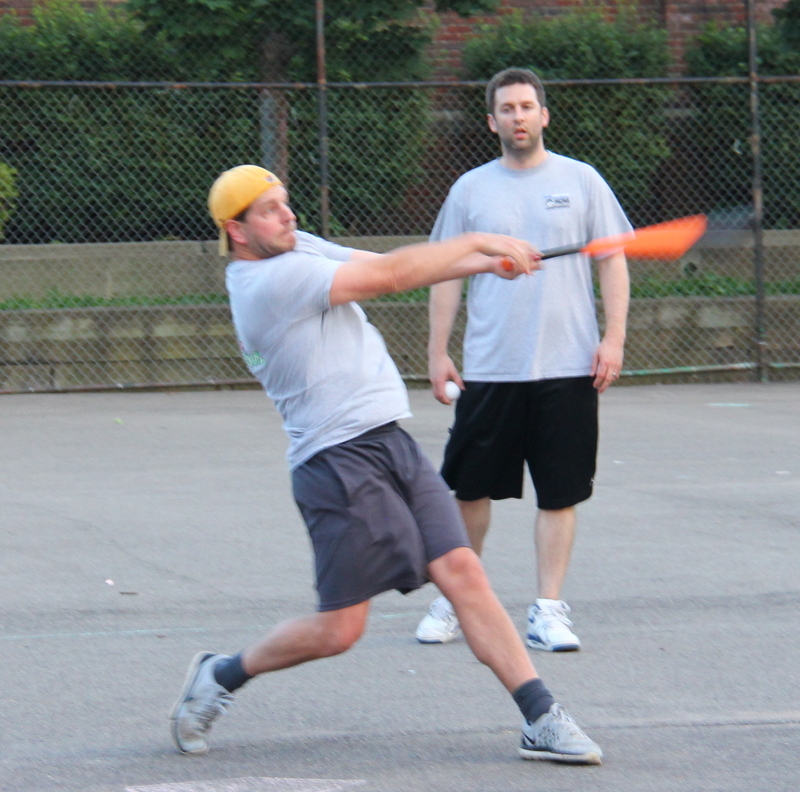 Josh singled with one out, and he moved to second when Dave, making his first EWL appearance, followed with a single. Tim then singled, scoring Josh to make the score 1-0. The Ham Slams had two runners on, but BK retired Dan to strand them both and end the inning. Ivan, who was a cornerstone of the Eastbound lineup for years, took the leadoff position in the Eastbound lineup while he was in town from Chicago. He singled in his first at-bat of the season, and moved to second when Nate followed with a sacrifice fly. Christian then hit an RBI triple, and Eastbound had manufactured a run in a way that they had previously been unable to in 2016. The Ham Slams starter, Dan, retired BK to end the inning, and the game was tied at 1-1. Dave would single with one out in the top of the second, but BK retired Tim to strand the runner, and the game remained tied. Eastbound would jump out to a lead in the bottom of the second. Nate doubled with one out, and he moved to third on a Christian single. With one down and runners on the corners, BK doubled off the fence, scoring both runners to put Eastbound ahead 3-1. Ivan then followed with an RBI triple, scoring BK, and Eastbound led 4-1. 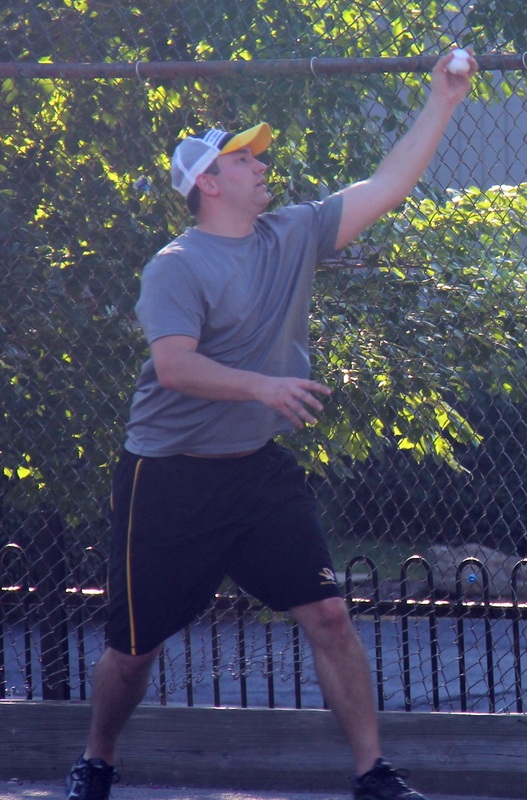 Dan then retired Nate to end the inning, and the Slams trailed by three. Josh would single with one out in the top of the third, but BK continued to strand Ham Slams runners, sending Dave down to maintain the three run lead. Dan got back to form in the bottom of the third, retiring Christian and BK in order. BK matched him in the top of the fourth, sending Tim and Dan down consecutively. Eastbound extended their lead in the bottom of the fourth. Ivan led off with a single and moved to third on a Nate double. Christian then grounded out for the first out of the inning, but Ivan scored on the play, putting Eastbound ahead 5-1. 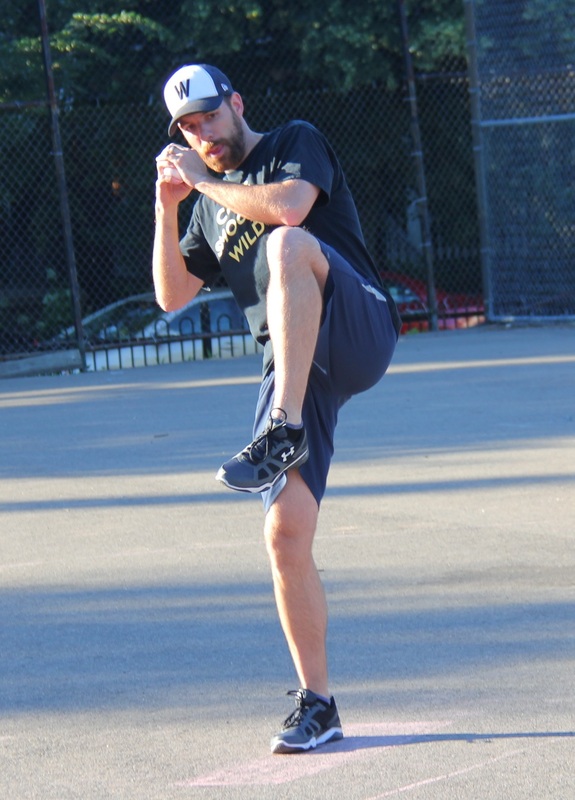 Dan avoided further damage, retiring BK to strand Nate and end the inning. The Slams would cut into the deficit in the top of the fifth. Dave doubled with one out, and Tim drove him in with an RBI double to make the score 5-2. On the play, however, Tim was caught trying to extend the double into a triple, and he was retired for the second out of the inning. Eastbound would make up for the runs in the bottom of the fifth. Ivan started the inning with a single, and Nate followed with a two-run blast to left-center. Dan retired Christian and BK to avoid a big rally, but Eastbound led 7-2 heading into the final frame. Josh started the top of the sixth with a single, and he moved to third on a Dave double. Tim then followed with an RBI single, scoring Josh, but Dave was caught out trying to score on the play. BK then retired Dan for the second out of the inning, and Eastbound held on to win 7-3. The win moved Eastbound to 1-10 on the season, and the loss dropped the Ham Slams to 6-5. – BK pitched the complete game win for Eastbound, allowing 3 runs on 11 hits in 6 innings pitched. 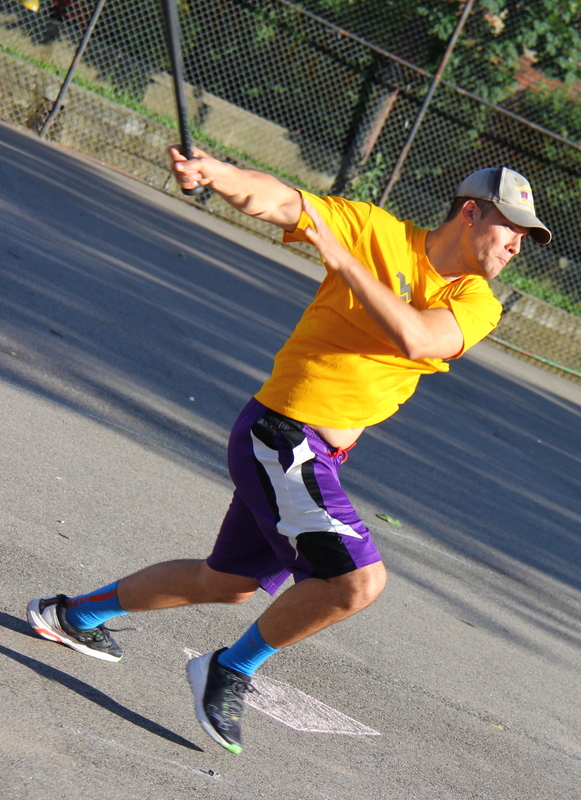 – Dan took the loss for the Ham Slams, giving up 7 runs on 10 hits in 5 innings. – Ivan led Eastbound & Dahn on offense, going 4-for-5 with 3 singles, a triple, 3 runs scored, and an RBI. – Nate also went 3-for-5 for Eastbound with 2 doubles, a homer, 2 runs scored, and 2 RBI. – In his first EWL appearance, Dave led the Ham Slams at the plate, going 4-for-5 with 2 singles, 2 doubles, and a run scored.